Players begin with a hand of cards, each an element to work into the story being told. As they tell their story, they play a card, and if they can link multiple cards from their hand together, they receive a bonus of some sort usable later in the defeat of the Great Old One (or his ascension if the player turns out to be a cultist). If something is mentioned and another player has a card matching what is mentioned, he takes over the story and uses his cards at that point. The objective is to tell a great story and then reach the climactic fight between the investigators and the Great Old One which is told in story-format as well. Cthulhu's Vault is co-designed by Richard Launius and Jim Dietz. 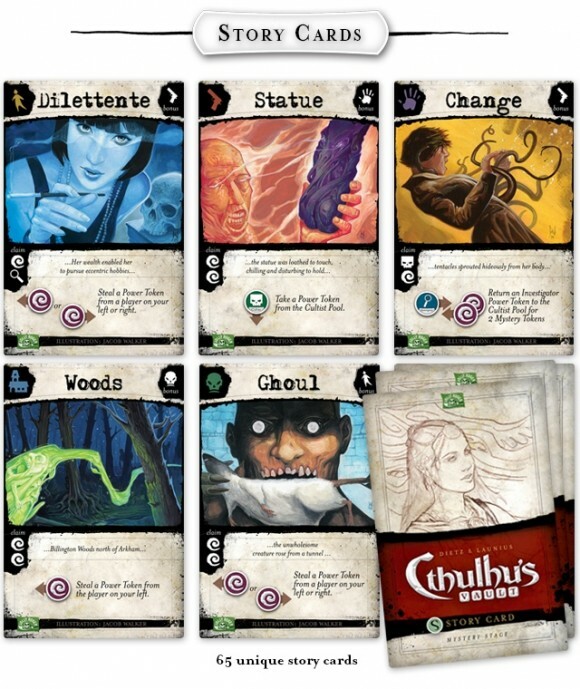 Launius is the designer of the classic Arkham Horror while Dietz is the author of 'The Cthulhu Rainy-Day Activity Book' and the Lovecraftian novel 'The Last Post'. Add a Review for "Cthulhu’s Vault"